The Lake Forest neighborhood is located in the northeast corner of St. Louis Park: on both sides of Cedar Lake Road, west of France Avenue. It was the brainchild of Douglas Rees, a builder billed as “realtor owner.” Rees had been in the real estate development business since 1924. He had purchased the 80 acre parcel from the McNair Estate for $25,000. (McNair had been a land speculator.) The land was platted in 1939 – “more than 80 acres for less than 150 families.” Rees explained that “larger homesites [100 x 200] are required for the low rambling homes of current architectural style, and the winding lanes without conventional city-type street improvements, and with through traffic barred out, simulate country estates, without forfeiting urban conveniences and services.” Rees further described the project as “the last large restricted area available for exclusive home construction along the entire length of the west city limits, from Robbinsdale on the north, southward to 58th Street.” A 1940 ad mentioned “No old-fashioned city sidewalk, curb or gutter.” When curbs were finally built in the ’70s, the neighborhood convinced the City to modify them to look more natural. Access to Minneapolis was by the Bryn Mawr bus. The average lot in 1939 was $1,100. In time, an additional 80 lots were developed to the west. In the 160 acres that now makes up Lake Forest, in 1992 there were only 178 families. Why Rees named the subdivision Lake Forest is unknown. He built his own modest home on the corner of Glenhurst and Cedar Lake Road. Construction stopped during World War II. McNair Park: This subdivision, which we share with Minneapolis to the east, has 23 of a total of 152 lots in St. Louis Park. It was platted in 1889, and the oldest home in the subdivision that is in St. Louis Park dates to 1925. 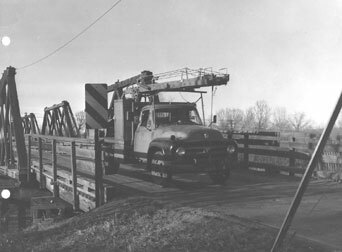 In 1964, the Great Northern Railroad tore down a bridge that had crossed its tracks on Cedar Lake Road, near the present-day Sabes Jewish Community Center. A photo in the April 30 issue of the Dispatch shows a frustrated resident holding a “HELP!” sign, hoping for the rebuilding of his route into Minneapolis. It has since been replaced by a pedestrian bridge. 1950 Photo courtesy City Engineering Dept. Deep in the archives, we found this list of questions, probably generated by the neighborhood association. If you know the answers, please contact us! What was the original sales “office” for lots in Lake Forest? Who laid out the roads and homesites? What was his gift to the City? What did he pay for the original 80 acres? Where did one of his partners live in Lake Forest? Who has lived in Lake Forest the longest? What is unusual about his walls? What lost landmark does he document? Why are so many houses built in 1941? What high-paid model lives in Lake Forest? What musical instrument does she play? How many people can you name who grew up in, and still lives in, Lake Forest? What did the kids call the hill where South Hill Lane runs today? What was Lake Forest’s contribution to the Second World War effort? What notorious bit of gunplay occurred in Lake Forest? Why have some walls in Lake Forest turned orange? What famous architect designed a Lake Forest Home? Who is Bill Lubov, and what is he going to say when he gets here?